Albion boss Chris Hughton felt tonight's 1-1 draw with Ipswich was two points dropped as his side missed the chance to return to the top of the Championship. Ipswich went ahead through Luke Chambers early on but Tomer Hemed levelled from the penalty spot on 29 minutes. 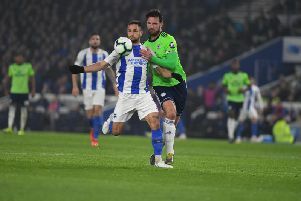 Both sides had chances in the second half, with Albion's best opportunities falling to Sam Baldock, who was denied by Bartosz Białkowski, and Glenn Murray, who hit a post in injury-time. Brighton would have gone back to the top with a win as leaders Newcastle drew 2-2 at Norwich and Hughton said: "At this moment it feels like two points dropped because we were playing at home and it was a real good opportunity. "On the balance of play, it's a game we should have won. I'm quite sure that with the possession stats in the final third, we would have had more opportunities than them. "But you've got to be carefiul to take everything into perspective. We've got a very good record at home and it didn't happen for us today. "On other days, we'd have got the winner in the last ten to 15 minutes as we had good chances. "We mustn't go away from the fact that we're in a very good position in the league and deserve to be there." Reflecting on the match, Hughton said: "It was a strange game and a frustrating one, we certainly didn't play at the level we know we can. "It was frustrating to concede when we did, it gives a good Ipswich side a massive lift at that stage of the game. Certainly by the time we got the equaliser we deserved it on the balance of play but our levels weren't as good as what they've been. "In the second half it became a very open game and at 1-1, I thought we were more in the ascendancy and if there was a team more likely to score, I think it was us. Glenn and Sam probably had our clearest chances and they had one very good chance at the start of the second half." Ipswich boss Mick McCarthy said: "I'm immensely proud but it wasn't back to the walls, resolute, defend and nick a point. I think their keeper kept them in the game to be quite honest. "They're a good side, they passed it, they moved it and we've had to defend but we've had some chances. "They hit the post late on and it would have been a criminal injustice if that had gone in after the way we played."